Sometimes even the best products need help. And when they do, our team of factory trained technicians are ready. 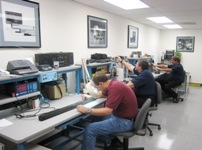 Our service center is equiped with the latest test equipment and is stocked with genuine replacement parts. For your convenience our friendly and knowledgeable technicians travel too. We can	perform repairs on site to get your equipment back up and running quickly. We’re confident that we will successfully repair your equipment. However; if your equipment cannot be repaired due to age, availability of replacement parts or if it is simply not cost effective, we will help you select a suitable replacement. In addition to our repair services we employ technicians who are specialists in the field of machine tool metrology. These technicians use the latest laser interferometry equipment to measure and calibrate manual and CNC machines to achieve the greatest accuracy possible. All of our metrology equipment is routinely calibrated with certifications traceable to NIST. Our number one goal is 100% customer satisfaction. Call us today to speak with one of our experienced customer support team members (909) 614-4522 or fill out the service request form below and we will contact you. Either way you can't loose. We will make sure you are fully informed before making any decisions.